1968-00-00 Unknown Source - ILL "The 1862 plat map shows a triangular shaped lot in the northwest postion of Section 17 and the portion of Section 18 owned by Chauncey Higgins. The 1860 federal census describes Higgins as being a 46 year old farmer from NY, and his wife Emily as 27 also from NY. The had seven children, all born in Illinois. Ty 1914, the property was owned by James McMicken and Franklin Clow latter buying out the former twenty years later. Franklin Clow's three childre owned the land by 1968. Subsequesntly, the land was developed into the Clow Airport. The airport, comprising 70 acres, was sold in 1998 to Mr.Joe DePaulo of naperville, and the remainder of the farmland was sold and commercially developed." Aviation Museum - ILL (www.ilsos.gov) "CORP/LLC - CERTIFICATE OF GOOD STANDING"
Bolingbrook Mayor Roger Claar and Phil Boyer at Clow International Airport Some Clow Airport History ILL 06/28/2004 (www.aopa.org) "Illinois mayor saves airport"
"In the late 1950s, farmer Boyd Clow fell in love with flying and built a grass airstrip. Before long, other pilots approached him about tying down their aircraft, and the airport ultimately developed into one of the busiest fields in Illinois. Today Clow International Airport sports a thriving FBO, a busy flight school, a popular on-field restaurant, and some 150 based aircraft. 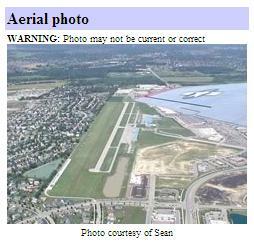 (See AOPA Pilot, March 2003.) And the airport is the home of the Illinois Aviation Museum at Bolingbrook. 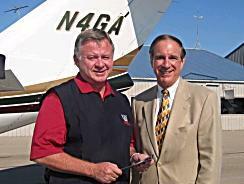 (It was a museum officer who told AOPA about the mayor's support for the airport and museum.)" "Clow sold the airport to another private owner in 1998. In March of this year, [Bolingbrook Mayor Roger Claar] Claar pushed through a $25 million bond issue for the village to buy and upgrade the airport to make it more attractive to corporate operators. Improvement plans include widening and lengthening the runway to 4,000 feet, adding new runway lights, and building more hangars and a pilot facility." "When Roger Claar moved to Bolingbrook in 1975, the town was little more than a series of subdivisions. Home prices started at well under $100,000, and many residents left as soon as they could afford to move to bigger houses in next-door Naperville or other more established places. Claar recalls the town as a kind of suburban way station for "young immigrants." In those days, Claar was a young immigrant himself—a 29-year-old low-level school administrator who had emerged from his downstate hometown of Effingham with a chip on his shoulder and no clear sense of direction. He found a home in this suburban noplace." "He's been at it for almost three decades, the last two of them as mayor. During his tenure, [Mayor Roger] Claar has overseen a huge increase in the range of housing prices and a near doubling of the population to around 75,000. He's brought in business, most obviously in the form of the shallow canyon of distribution centers you drive through on I-55 between Chicago and I-80. He's bought a private airfield and renamed it Bolingbrook's Clow International Airport. In addition to the golf course, he's built a sparkling new outdoor mall, a new high school, and a new hospital." 2007-10-28 CNN Nancy Grace 09:00 PM ILL RICK MIMS: "Stacy supposedly called and told him [Drew Peterson] that she found somebody else, she`s taking a vacation, If you want the car, it`s parked over at Clow." - MIKE BROOKS: "And if that -- what did he say what time that was?" - RICK MIMS: 9:00 o`clock, 9:00 PM"
2007-10-28 chicagosuburbannews 00:00 PM ? 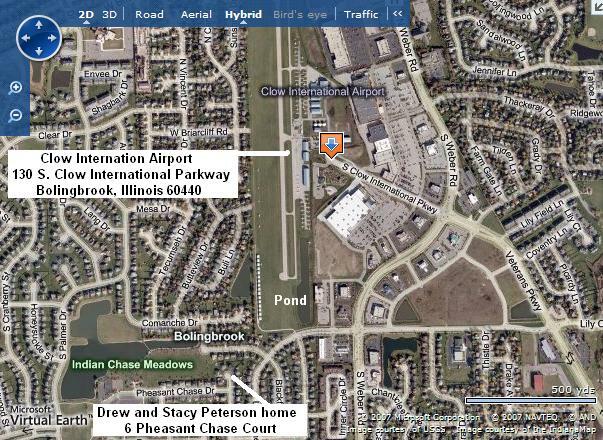 ILL "Bolingbrook police now say Drew Peterson told investigators Stacy called to tell Drew that her vehicle was at Bolingbrook Clow International Airport and that he should pick it up. According to Ken Teppel, spokesman for the Bolingbrook Police Department, Drew Peterson told police he went to the airport and retrieved the vehicle. “(Drew Peterson) told us Stacy called him Sunday night to tell him the vehicle had been left at the airport, and he said he went there to recover it and brought it home that night,” Teppel said. No details were provided on whether Drew Peterson was driven to the airport to retrieve the vehicle or whether he walked there. [less than 400 yards]"
Both cars in Peterson driveway ILL [findstacypeterson.com Timeline]: "Cassandra returns to house and sees both cars in the driveway. Bruce [Zidarich] calls Drew, Drew says Stacy called him at 9pm and left the car at the whatchamacallit. Drew says let me get head straight, Stacy called at 9pm and left the car at Clow airport." "I heard him [Drew] when he told you the bikini thing but he never told me that." Download ILL November 12th, 2007 6:20 PM Eastern, GretaCast - Listen to What Sgt. Peterson’s Friend Ric Mims Has To Say, by Greta Van Susteren - (acandyrose.com HERE listening to audio file:"
GRETA: When you and I first met, she disappeared on Sunday [10/28] and you started staying at Drew's house on Tuesday [10/30], is that right? GRETA: And then on Wednesday [10/31] that's when I showed up and that's when I first met you. MIMS: Right we were both sitting there when you were interviewing Drew. GRETA: Actually when I was interviewing Drew you heard him or maybe you didn't hear him tell me that when she left that she took money and a bikini? GRETA: Have you ever heard him telling that to anyone before? MIMS: No, what he told me was that Stacy has found somebody else she wants to be with and she's taken off with him, she's took a large amount of money from the house that was cash and told him she was going on vacation for a while and to pick up the car at Clow Airport. GRETA: But you never heard the bikini thing? MIMS: I heard him when he told you the bikini thing but he never told me that. GRETA: You hear him tell that to anybody else? MIMS: No, no, I believe you're the only one he told that to." 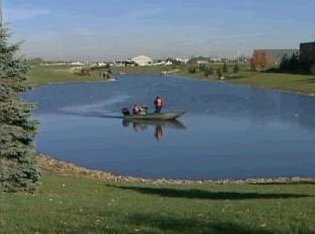 November 1, 2007 Unsuccessful images from Clow Airport web cam ILL "Meanwhile, at least five police divers entered a pond at Bolingbrook's Clow International Airport, where a manager said police earlier this week tried unsuccessfully to review previous images from a Web cam. Federal Aviation Administration records indicate Drew Peterson is licensed to fly a plane, but manager Joe DePaulo said there were no records that Peterson had used the airport." Drew, friend moved big plastic tub ILL VIDEO: FoxNews Kevin Tomich reports: "Yesterday [11/01] during the search of Peterson's home a cadaver dog made a hit in the Peterson's upstairs bedroom and also out in the pond next to Clow Airport in Boilingbook where Stacy Peterson's car was abandon and where her husband has a plane." VIDEO: FoxNews Kevin Tomich reports: "Also told by a source that Drew Peterson called a friend after Stacy Peterson disappeared and asked him to come over and help him move a large plastic tub." 2007-11-02 www.suntimes.com Searchers scour pond for nearly seven hours ILL "Divers from the Naperville and Plainfield police departments stretched a cable across the bottom of the pond [near Clow International Airport, 130 S Clow International Pkwy, Bolingbrook, IL 60490-5507], then two divers slowly swam along the cable, feeling along the bottom for objects. 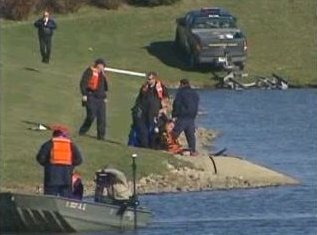 After the divers completed each sweep, the cable was moved a foot or two along the bank, allowing the divers to swim back across and search a new area of the pond." November 23, 2007 - ILL 11/23/2007 (cbs2chicago.com) "Neighbor Claims Strange Activity By Drew Peterson"
"In addition to the missing blue barrel that police have told the family they're looking for, sources say scuba diving weights are also missing from Drew's house. 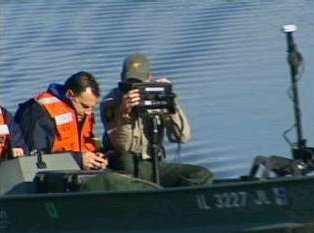 That may have led investigators to search numerous ponds, including one near Clow Airfield where sources say cadaver dogs hit on something." - "Sources say the dogs also hit on something in an upstairs bedroom of the Peterson house -- the same bedroom where sources say a nightstand is believed to have turned up missing. That's led investigators to question recent visitors to the Peterson home about what furniture they recalled seeing in that room."